Overland travel is about the journey. Seeing the world, the wildlife, the scenery, while leaning about its history and experiencing its cultures is the goal. The roads may not always be paved and the trails can be challenging which is why a moto is an excellent means of transportation. 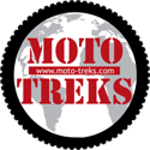 Moto-Treks provides travel information for the Overland motorcycle traveler - Enjoy!